Megan Y. Carannante is an effective and seasoned litigator and counselor who focuses her practice primarily on business, employment and construction disputes. She has represented a wide range of clients from small business owners to Fortune 500 companies in state and federal court, mediation and arbitration. She also regularly represents companies before the Connecticut Commission on Human Rights and Opportunities and other state and federal agencies. A former Connecticut Appellate Court clerk, Megan also has significant appellate experience. She is admitted to practice in Massachusetts and New York as well as Connecticut and regularly represents clients in these jurisdictions. In addition to her litigation practice, Megan regularly counsels employers to ensure they are in compliance with state and federal law and assists them in navigating and resolving complicated personnel issues. She provides sexual harassment training and other training to supervisors on a regular basis and assists employers in crafting employment policies which facilitate and promote a productive and inclusive workplace. 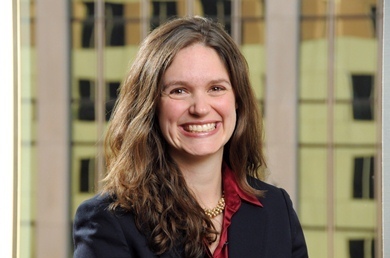 Megan is a recipient of both the Hartford County Business Journal’s “40 under 40 award” and the Connecticut Law Tribune’s "New Leader in the Law award” in recognition of her work and leadership both within the firm and the greater Hartford community. She has also been consistently recognized as a "Rising Star" by Connecticut Super Lawyers. Megan is an active member of the firm’s Women’s Leadership Initiative and Recruiting and Orientation Committees. She particularly enjoys mentoring associates and previously served as chair of the firm’s Associates’ Marketing Committee before her elevation to partner.